The last time we wrote about ZimSelector, the Zimbabwean online insurance aggregator, the startup had introduced a payment option and was working on signing on more insurance institutions to give users a wider range of options for credible comparisons. After a bit of silence the aggregator has now come out to announce the next phase of its growth. This has come in the form of a redesigned platform that now has a host of services from different insurers whose benefits and prices users can compare. There is also an ease of selection and purchase of the same products. To make this a reality, ZimSelector worked with a UK based development outfit called Total Systems Plc. This decision was likely prompted by the need to work with a team that has extensive experience with similar insurance and financial models. ZimSelector.com came onto the tech startup scene as the first comprehensive online financial services shopping mall and comparison site dedicated to Zimbabweans at home and abroad. According to ZimSelector founder Luke Ngwerume, the startup’s focus has always been to leverage on the internet to change the approach Zimbabweans have when it comes to purchasing their financial products. This online strategy also targets Zimbabweans based all over the world, that are now able to compare and buy products anywhere and at anytime. ZimSelector has now signed on more insurance and investment focused firms of repute which include CBZ, CABS, Fidelity Life, NICOZ Diamond, Old Mutual Group, RM Insurance and the Zimnat Life and Zimnat Lion. According to the ZimSelector more brands are set to follow. 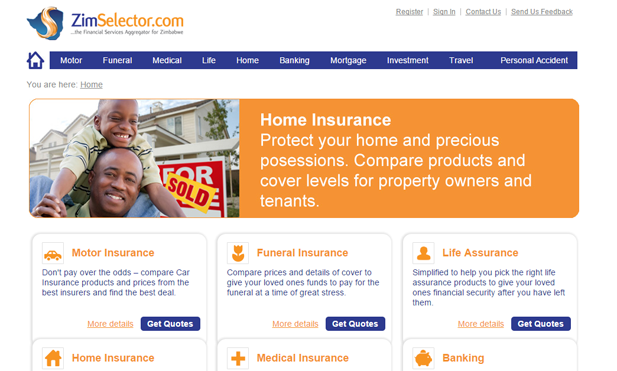 Have you used this service to compare insurance products recently? What has been your assessment of its changes? The ZImSelector press release can be found below.